Ebicha hakama - Maroon hakama, the second design from the new series Hyakunen no Hana - Flowers of a Hundred Years, self-printed in an edition of 100 in November 2012. 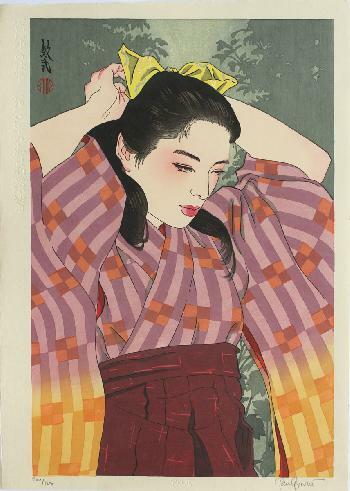 The second of a series of 10 bijin prints illustrating women in the decades of the 20th century. The title refers to the trouser-like over-kimono worn by the girl in the print, which identifies her as a female university student. Fine impression, colours and condition: this complex design employed 47 printings, including silver metallic pigment and 23 carat gold leaf in the hair ribbon.